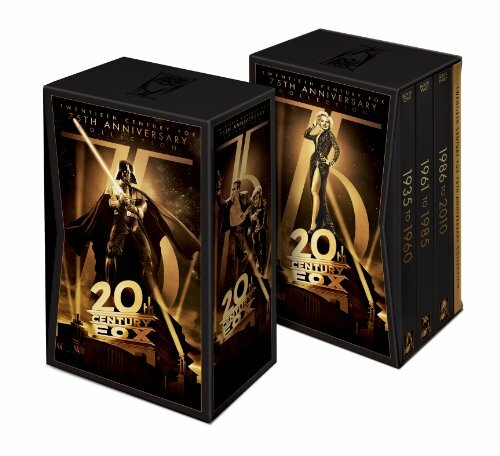 Twentieth Century Fox Home Entertainment paints the town diamond white with the release of the Twentieth Century Fox 75th Anniversary Gift Set, a 75-film, three-volume set, highlighting a remarkable, rich and unparalleled heritage of classic films, Academy Award® winners and box office smashes. Each of the three volumes cover 25 years of the studio’s legacy along with an exclusive hard cover book detailing the historic filmmaking of some of the greatest movie stars and directors from yesterday and today. The massive DVD set features a variety of genres and some of the finest films of all time from South Pacific to Star Wars, Alien to Avatar and Gentlemen Prefer Blondes to The Devil Wears Prada. Among its 46 Academy Award®-winning features, the collection highlights seven Best Picture winners including How Green Was My Valley, All About Eve, The Sound of Music, Patton, The French Connection, Slumdog Millionaire and the DVD debut of Cavalcade. Cavalcade (1933): This Academy Award-winning film looks at English life from New Year’s Eve 1899 to New Year’s Day 1933 through the eyes of a well-to-do couple (Diana Wynyard, Clive Brooks). Steamboat Around the Bend (1935): Will Rogers stars in this comedy about a conman who enters a winner-take-all steamboat race, all while trying to clear his nephew of a crime. Directed by John Ford. The Little Princess (1939): Based on the novel by Frances Hodgson Burnett, Shirley Temple portrays Sara, the daughter of a British officer who is left in boarding school when her father goes off to war. The Grapes of Wrath (1940): Nominated for seven Academy Awards, this adaptation of John Steinbeck’s novel tells the story of the Joads, a migrant family trying to get to California to escape the Dust Bowl. Blood and Sand (1941): Tyrone Power and Rita Hayworth star in this story of a matador torn between his loving wife and a beautiful, unscrupulous aristocrat. How Green Was My Valley (1941): Winner of five Academy Awards including Best Picture and Best Director (John Ford), the film looks at the struggles of a Welsh mining family. Maureen O’Hara and Roddy McDowall star. The Ox-Bow Incident (1943): Henry Fonda stars in this story of two drifters who join a local posse to catch a local farmer’s murderer. When they find the perpetrators, they are determined to see justice done on the spot. The Song of Bernadette (1943): Jennifer Jones stars as Bernadette, a peasant girl who sees a vision. When the news spreads, a town doctor (Lee J. Cobb) accuses her of insanity and the town prosecutor (Vincent Price) threatens her. The film won four Academy Awards, including Best Actress. Laura (1944): Otto Preminger directs this story of the murder of a young woman (Gene Tierney) and the police detective (Dana Andrews) who becomes entranced by her portrait. Gentleman’s Agreement (1947): A journalist (Gregory Peck) poses as a Jew, and soon discovers what is to be a victim of religious intolerance. The film won three Academy Awards including Best Picture and Best Director (Elia Kazan). Miracle on 34th Street (1947): Natalie Wood stars as a girl who has been taught not to believe in Santa Claus. But when a man who says he’s Kris Kringle is put on trial, only true belief can save him. The film won three Academy Awards. Twelve O’Clock High (1949): Gregory Peck stars as a World War II general who adopts a crushing discipline to revitalize his demoralized troops. The film was nominated for four Oscars®, including Best Actor. All About Eve (1950): From the moment she meets her idol, Eve Harrington (Ann Baxter) is determined to take the reins of power away from the great actress Margo Channing (Bette Davis). Nominated for 14 Oscars, the film won six, including Best Picture. The Day the Earth Stood Still (1951): When an alien lands on the planet, he gives a dire warning: either the people of earth live peacefully or they will be destroyed. Patricia Neal co-stars. Gentlemen Prefer Blondes (1953): Marilyn Monroe and Jane Russell star in this musical comedy about two women who take a cruise to Paris only to be trailed by a private detective who is sure Monroe’s character won’t be faithful to her fiancé. The Robe (1953): Richard Burton stars as a man who receives Jesus’ robe after he helps engineer his crucifixion. He’s then tormented by nightmares, and decides to learn more about the man he helped kill. The film was nominated for five Oscars, including Best Picture. The Seven Year Itch (1955): When a married man (Tom Ewell) is left alone during a steamy New York summer, he discovers a tough temptation in the form of a new upstairs neighbor (Marilyn Monroe). The King and I (1956): An Englishwoman (Deborah Kerr) comes to Siam to teach the King’s (Yul Brenner) children. This musical features a score by Rodgers and Hammerstein and choreography by Jerome Robbins. The film was nominated for seven Oscars and won four, including Best Actor. Love Me Tender (1956): Elvis Presley stars as one of three confederate brothers who, when he thinks his older brother has died in the war, marries the brother’s true love (Debra Paget). An Affair to Remember (1957): Though Cary Grant and Deborah Kerr are engaged to other people, they fall in love and agree to meet six months later at the Empire State Building. The film was nominated for four Academy Awards. South Pacific (1958): Rodgers and Hammerstein's film tells the story of a young Navy nurse (Mitzi Gaynor), who falls for a plantation owner (Rossano Brazzi) on a South Pacific Island during World War II. The film was nominated for three Oscars. The Diary of Anne Frank (1959): After the Nazi invasion of Amsterdam, 13-year-old Anne Frank (Millie Perkins) and her family go into hiding in the confines of an attic, while Anne keeps an account of their lives. Nominated for eight Academy Awards, the film won three, including Best Supporting Actress for Shelley Winters. The Hustler (1961): Paul Newman stars as a down-on-his-luck pool player who meets his match in Sarah (Piper Laurie). But when a gambler (George C. Scott) decides to back the pool player, Newman learns what being a “winner” entails. The film was nominated for nine Academy Awards. The Longest Day (1962): Nominated for five Oscars, this epic film tells the story of the D-Day invasion of Normandy during World War II from both the Allied and German points of view. Cleopatra (1963): Elizabeth Taylor stars as the woman who comes between Julius Caesar (Rex Harrison) and Mark Anthony (Richard Burton). The film was nominated for nine Academy Awards. Zorba the Greek (1964): Anthony Quinn stars as a boisterous Greek peasant with a love for life who befriends an inhibited English writer (Alan Bates). The film was nominated for seven Oscars. The Sound of Music (1965): Julie Andrews stars as Maria, a spirited young woman who leaves the convent to bring love and music to the home of Captain von Trapp (Christopher Plummer) and his seven children. The film won five Oscars, including Best Picture. Fantastic Voyage (1966): When a top government scientist faces death from a blood clot on his brain, a group of scientists shrink themselves and their craft so they can perform emergency surgery from inside his body. Rachel Welsh co-stars. The film was nominated for five Academy Awards. The Sand Pebbles (1966): Steve McQueen and Candice Bergen star in these intertwining stories that take place in 1926 China about the Americans who are caught in the country’s turmoil. The film was nominated for eight Academy Awards. Planet of the Apes (1968): Charlton Heston stars as an astronaut who crash lands on a distant planet ruled by apes who use a primitive race of humans for experimentation and sport. The film was nominated for two Academy Awards. Butch Cassidy and the Sundance Kid (1969): Paul Newman and Robert Redford star as the title gunfighters who find themselves being chased by a mysterious posse. They decide to head down to Bolivia for a new life. The film was nominated for seven Oscars, including Best Picture. Hello Dolly! (1969): Barbra Streisand stars as Dolly Levi, a young widow and professional matchmaker, who sets her sights on Horace Vandergeider (Walter Matthau). Directed by Gene Kelly, the musical was nominated for seven Oscar, including Best Picture. MASH (1970): Robert Altman directs this story of three Korean War army surgeons (Donald Sutherland, Tom Skeritt, and Elliott Gould), who use humor to get them through the horrors of the war. The film was nominated for five Oscars and won one for Best Screenplay. Patton (1970): George C. Scott won an Oscar for his role as one the 20th century’s most controversial military geniuses. The film was nominated for 10 Academy Awards and won seven, including Best Picture and Best Director for Franklin J. Schaffner. The French Connection (1971): Gene Hackman stars as New York detective “Popeye” Doyle who, along with his partner (Roy Scheider), sets out to break up a narcotics smuggling ring. Nominated for eight Oscars, the film won five, including Best Picture, Best Actor, and Best Director for William Friedkin. Poseidon Adventure (1972): Ten survivors struggle to escape from an ocean liner capsized by a tidal wave. Gene Hackman and Shelley Winters co-star in this adventure that was nominated for eight Oscars. Phantom of Paradise (1974): Directed by Brian DePalma, this film tells the story of a composer determined to seek revenge on the record tycoon who steals his pop cantana of the Faust legend. The film’s music was nominated for an Oscar. Young Frankenstein (1974): Mel Brooks directs this comic tribute to Mary Shelley’s classic. Gene Wilder stars as young Dr. Frankenstein, who discovers his grandfather’s sinister experiments and decides to continue them. The film was nominated for two Oscars. Rocky Horror Picture Show (1975): Susan Sarandon, Tim Curry, and Meat Loaf star in this cult class about a couple who take refuge from in the castle of Dr. Frank-N-Furter, a transvestite made scientist from outer space. The Omen (1976): Gregory Peck stars as an ambassador who slowly comes to realize that his son is the antichrist. He decides to kill him to rid the world of evil. The film was nominated for two Oscars. Star Wars (1977): Luke Skywalker (Mark Hamill) must leave his home planet in order to save Princess Leia (Carrie Fisher) from Darth Vader and the evil Death Star. The film was nominated for 10 Academy Awards. Alien (1979): Ridley Scott directs this story of a spaceship crew who stumble across an alien life form that is perfectly evolved to annihilate mankind. The film was nominated for two Academy Awards. All That Jazz (1979): Bob Fosse directs this semi-autobiographical story of his alter-ego (Roy Scheider), who struggles with booze, drugs, work, and women, all while fantasizing about death (Jessica Lange). The film was nominated for nine Oscars. Norma Rae (1979): Sally Field won an Oscar for her portrayal of a Southern millworker who revolutionizes a small town by organizing her fellow factory workers. The film was nominated for four Academy Awards. Cocoon (1985): Three old men (Wilford Brimley, Don Ameche, Hume Cronyn) find a fountain of youth when they go for a dip in a swimming pool filled with mysterious cocoons. The film won two Oscars, including Best Supporting Actor for Ameche. Raising Arizona (1987): Joel and Ethan Coen direct this comedy about a couple (Nicholas Cage and Holly Hunter) who steal a baby when they discover they can’t have one of their own. Wall Street (1987): Michael Douglas won an Oscar for his portrayal of Gordon Gekko, a corporate raider whose motto is “greed is good.” Charlie Sheen co-stars as his naïve protégé. Big (1988): When a 13-year-old boy wishes he was “big,” he wakes up the next day as an adult, who must find his way in the world and winds up working at a toy company. Tom Hanks and the screenplay were both nominated for Academy Awards. Die Hard (1988): Detective John McClane (Bruce Willis) just wants to spend Christmas with his family, but when his ex-wife’s building is taken hostage, it’s up to him to save the day—in bare feet. The film was nominated for four Oscars. Working Girl (1988): Long Island secretary Tess McGill (Melanie Griffith) just wants to get ahead, so when her boss goes out of town, she pretends to have her boss’s job. Sigourney Weaver and Harrison Ford co-star in this film that was nominated for six Oscars. Home Alone (1990): Macauley Caulkin stars as a young boy accidentally left behind when his family goes on vacation. His ingenuity helps him deal with two bumbling burglars (Joe Pesci and Daniel Stern). The film was nominated for two Oscars. The Last of the Mohicans (1992): Daniel Day-Lewis stars as Hawkeye, a rugged frontiersman and adopted son of the Mohicans, who falls in love with the aristocratic daughter (Madeline Stowe) of a British Colonel. The film won one Academy Award. Mrs. Doubtfire (1993): Robin Williams stars as a man who, in order to spend time with his children, pretends to be his wife’s female housekeeper. The film won an Oscar for Best Make-up. Speed (1994): When a mad bomber (Dennis Hopper) threatens to blow up a bus if it goes under 50 miles per hour, it’s up to a cop (Keanu Reeves) and one of the passengers (Sandra Bullock) to try to thwart his plan. The film was nominated for three Oscars. Waiting to Exhale (1995): Based on Terry McMillan's novel, the film follows the love lives of four African-American women (Whitney Houston, Angela Bassett, Loretta Devine, Lela Rochon). The Crucible (1996): Based on Arthur Miller’s play, the film brings the 1692 Salem witch trials to life when a group of teenage girls is accused of witchcraft. Hysteria blankets the town and blameless victims are torn from their homes. Daniel Day-Lewis and Winona Ryder star in the Oscar-nominated film. Independence Day (1996): When aliens launch an all-out invasion against the human race, it’s up to a military pilot (Will Smith), an ex-scientist (Jeff Goldblum), and the president (Bill Pullman) to unite for one last strike against the invaders. The film was nominated for two Oscars. The Full Monty (1998): Six out-of-work steel workers in Sheffield, England, decide to put on a Chippendale’s-style male strip show in order to make money. The film was nominated for four Oscars. There’s Something About Mary (1998): Ted (Ben Stiller) is still in love with his high school prom date, Mary (Cameron Diaz), even though it's been years after the humiliating incident that cut their date short. The Farrelly brother’s direct this raunchy comedy. Boys Don’t Cry (1999): Hilary Swank won an Oscar for her role as Brandon Teena, a transgendered teen who lives as a boy, but is biologically female. Chloë Sevigny was also nominated for Best Supporting Actress. Cast Away (2000): Tom Hanks stars as a Fed-Ex employee who must survive on a deserted island after his plane crashes into the ocean. The film was nominated for two Academy Awards. X-Men (2000): A group of mutants with super-human powers learn to use their abilities for good under the tutelage of Professor Xavier (Patrick Stewart). They face off against another group of mutants led by Magneto (Ian McKellen). Moulin Rouge! (2001): When a penniless writer (Ewan McGregor) falls for a beautiful courtesan (Nicole Kidman), they put together a fabulous show and attract the attentions of a jealous duke. The film was nominated for eight Academy Awards. Ice Age (2002): A sabertooth tiger (Denis Leary), a sloth (John Leguizamo), and a woolly mammoth (Ray Romano) try to return a young boy to his home in this animated adventure. Minority Report (2002): Tom Cruise stars as a cop in the future whose unit can predict crimes before they happen. But when he’s accused of a future crime, he must try to change the future. Master and Commander: The Far Side of the World (2003): Peter Weir directs this adaptation of Patrick O'Brian novel about a brash British captain (Russell Crowe) in pursuit of a French ship during the Napoleonic Wars. The film was nominated for 10 Oscars. Sideways (2004): A wine-tasting road trip through California's central coast takes an unexpected detour as Miles (Paul Giamatti) and Jack (Thomas Haden Church) hit the gas en route to their mid-life crisis. Nominated for five Oscars, the film won one for Best Screenplay. Mr. & Mrs. Smith (2005): Brad Pitt and Angelina Jolie star as a married couple who don’t realize that they are both spies. When the truth comes out, their marriage becomes spy vs. spy. Walk the Line (2005): Joaquin Phoenix stars as Johnny Cash in this story of his life and how he came to love and marry June Carter Cash (Reese Witherspoon). Witherspoon won a Best Supporting Actress Oscar for her role. The Devil Wears Prada (2006): Based on the memoir by Lauren Weisberger about her time working for Anna Wintour at Vogue, the film tells the story of a cruel fashion editor (Meryl Streep) and her young protégé (Anne Hathaway). The film was nominated for two Oscars. Little Miss Sunshine (2006): A family is determined to get their young daughter (Abigail Breslin) to California for a beauty contest, even if they have to push-start their VW bus. Alan Arkin took home a Best Supporting Actor Oscar for his role as a straight-talking grandpa. Night at the Museum (2006): Ben Stiller stars as Natural History Museum night watchman discovers a curse that causes all the exhibits to come to life after the sunset. Juno (2007): Juno MacGuff (Ellen Page) is a teenager who takes a nine-month detour into adulthood when she's faced with an unplanned pregnancy--and sets out to find the perfect parents for her baby. Diablo Cody won an Oscar for her screenplay. Slumdog Millionaire (2008): Jamal Malik (Dev Patel) is just one question away from winning India's Who Wants To Be A Millionaire? But the show’s host can’t figure out how this boy knows all the answers. The film took home eight Academy Awards including Best Picture and Best Director for Danny Boyle. Avatar (2009): James Cameron directs this story of paraplegic marine (Sam Worthington) who gets a new chance at life when he’s sent as an avatar to infiltrate the Navi tribe on the moon Pandora. But he comes to respect the Navi ways. The film was nominated for nine Oscars.